Illuminate any room beautifully with this traditional bronze floor lamp topped with a natural linen lamp shade. From the Regency Hill collection of floor lamps, this handsome traditions floor lamp design will add visual appeal to any living room or seating area. The design features a decorative arm and base in a bronze finish. Up top is an empire-shape natural linen shade in off-white. 60" high. Base is 11" wide. Shade is 7" across the top x 13" across the bottom x 10" high. Weighs 13.2 lbs. Uses one maximum 100 watt standard-medium base bulb (not included). On/off socket switch. 96" brown cord; 13.2 lbs. net weight; 15.0 lbs. packaged weight. Off-white linen shade with decorative finial. Bronze finish footed base, decorative pole, and arm. Metal and resin construction. A traditional floor lamp design from the Regency Hill brand. Nice looking design that will go with our decor. Goes with my office perfectly and will send a picture once I get it set up. Going to use it for a reading nook in the office. Love Lamps Plus. I already have one so I know I like this lamp. It has a good heavy base, nice height & good lighting. This lamp is glamorous and classic standing there. It is beautiful and a great style! Very good sale and match my others ,very elegant and antique look . Because I like the looks of it. Beautiful lamps...I like the style.Will fit into my livingroom decor. 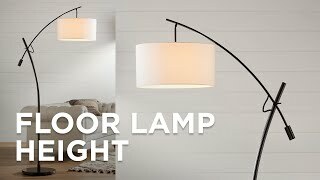 I have needed a new floor lamp for a while now and when I saw this one I thought it would be perfectt. And the sale price was excellent. Perfect for a dark corner in living room. Love the vintage look. The price is totally awesome, and the lamp is perfect for a smaller setting. Compliments my decor. Does the shade have a diffuser on the bottom? BEST ANSWER: No it doesn't have a diffuser, but we enjoy our lamp very much! No, the shade does not come with a diffuser on the bottom. BEST ANSWER: Hi, unfortunately we do not have any parts for this floor lamp. BEST ANSWER: Hi - this design weighs 13.2 lbs. 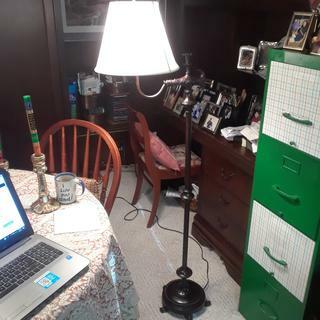 Although I haven't weighed it, I can tell you that it seems very sturdy, It is not a lightweight lamp,, although I am able to move it if needed. I hope this is helpful. Hi.. sorry I can't answer this question. I bought it for a friend and had it shipped to her house so I don't know how much it weighs.... but I do know she loves it !!! Delivery was prompt and the packaging was wonderful. Cons: I personally did not find any "cons"
Given its moderate price, this floor lamp is exceptionally sturdy. Its electrical cord is long and the cord and plug are not flimsy. 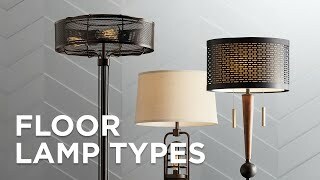 The shade that comes with the lamp is very attractive in size, shape, and texture. Using this one as an office lamp. 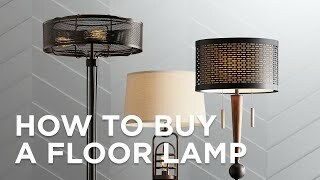 I originally bought two of these lamps for my tenant. He only wanted one, so I brought the other one into my house. I loved it! So, I ordered another so I could have one on each side of my sofa. I am also impressed by how quickly Lamps Plus gets the products to me. Sturdy, well-made -- a gorgeous standing lamp for the price. It fits nicely into my1930s living room. I like the weight of the base. Not crazy about the plastic parts (the finial was dropped upon assembly and broke right in half). I like it for the price and for the vintage styling, but was unhappy with the really poor packaging. It arrived intact, but the packing looked as if someone else had returned it and had taped it haphazardly together. Made me wonder if I should continue opening it or not risk finding a defective lamp. Glad I kept it and would recommend it for its low cost. Nice traditional look for a reading light. Looks good next to armchair. Would be nice if it took a three way bulb, but is still a great lamp.